Edit: this taping was later moved to 02/11. What can you say about this AAA lineup that can’t be said about any other one? The main feuds are still the same. There’s still no sure fire great matches, but the undercard matches might be ok. There’s still people who aren’t intersting and it’s still the same people. Not much is changing. Maybe that’s the story. The old AAA frustration is how they would do a lot at the big shows and not a lot inbetween. Maybe the newer AAA is doing the same, but the only big show is TripleMania. Wagner versus Psycho was announced a year ahead of time, and they might have been able to do the same with the Apaches and OGT. They’ve not moved that feud along an centimeter since TripleMania. The mystery person diversion was dropped on the last two tapings, like so many other AAA mysteries, so perhaps nothing is coming from that. They’re now doing the trios match they advertised in October in February, and maybe they’ll get around to a title match in March. That doesn’t leave much time (at least by AAA pace) to start another feud. It’s a 18 month build to Faby and Mary vs Averno and Chessman, or Faby vs Tirantes, or some such, only it’ll be more like a three month build with 15 months of running in place. Even if the destination was attractive, the journey is not. The third match is related to the cage match at Guerra de Titanes and the apuesta match at Rey de Reyes. AAA has me rooting for Argenis vs Carta not because it’s the best match, but because it’ll be an actual surprise. Not a good idea to root for those things, but Carta being in the match might finally solve the Carta Brava identity controversy. Angelico in a main event seems like such a positive thing, execpt it’s fairly obvious he’s not going to get to do most of what he can do. Maybe he’s got a secret comedy side? Dave being in the main event is fairly ridiculous. He is easily the worst guy on the whole show. Any one of the rudos in the opening match would do better in that spot. You could take any indie guy in that spot and they would do the same or better, because that’s what AAA has done. It’s also the same problem with Parka Negra: AAA’s done nothing to make people care about them, they’re just dropped into top matches without explanation. No one is getting over that way unless they’re an incredible worker, and that’s not Dave. Maybe AAA believes they can annoint anyone a star by just putting them on TV. They could point to Pagano, who is clearly their 2016 success story, but Pagano got a cool introduction, time to talk, and an indie rep. The people they’ve introduced since have not gotten any of that. The biggest challenge AAA has in 2017 is to make new stars to replace those they’ve lost, and ust placing people in main events is not enough. On that note, and noticing Johnny Mundo is not around after Guerra de Titanes, Petagon has to win that title match. Not only win, but win clean, and win dominantly. (Go watch his AAW title win, where he beat up Callihan’s entire crew by himself before winning without any controversy, and steal all that.) Pentagón is the rare modern lucha protagonist who the crowd won’t boo for being successful, and AAA must take advantage of it when they can. Mundo will be fine if he’s gone for months anyway. Same thing at the top here” Psycho has to start beating everyone not named Wagner, or they’re wasting a year of build. AAA needs to be more afraid of missing star making chances than losing people. Apaches v OGT cage, Tirantes goes in to help and loses his hair? Triple A is a failing company with no direction since Konnan left. They have plenty of stars to make an outstanding company but have no programming that appeals to anyone except those who just go to lucha to see lucha. They don’t develop long term feuds; they waste talent. Don’t get me started on Konnan and friends. At least Dorian stay with the lucha guys as opposed to some random uk wrestler that look like a kid. Dave The Clown, noted lucha guy. 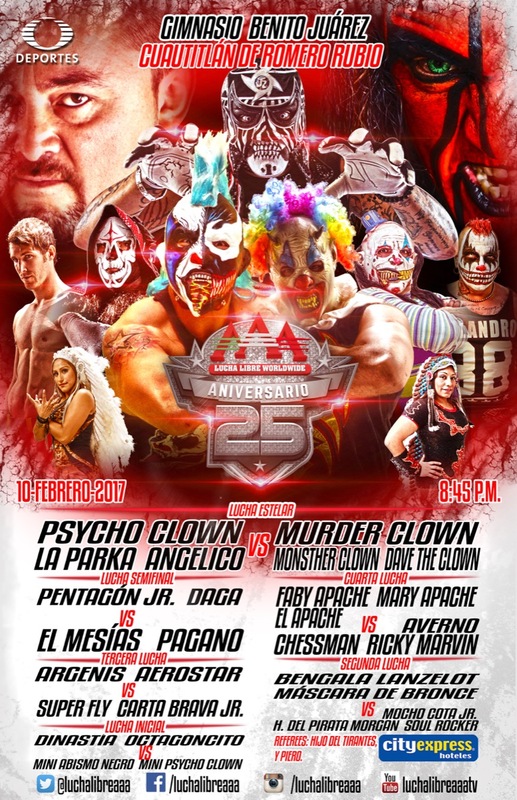 All signs right now point to Dr. Wagner Jr. vs Psycho Clown turning into a match where Dave The Clown is losing his mask at Triplemania.